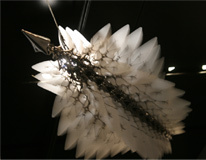 Korean artist Choe U-Ram's unique works explore the boundary between fine art and science, and in particular, cybernetics. With the current state of technological advancement, where robots in every day life are becoming a reality, and where the cloning of organisms is essentially possible, Choe's work is of particular interest. Choe favors flowers and insects as motifs for his sculptural works. And by incorporating simple elements of ‘motion’ into the sculptures, such as machine parts, sensors and/or lightbulbs, he successfully conveys the impression that he is actually creating new organisms. As a part of his production process, he also creates a detailed description of his new species, including its preferred habitat, distribution, growth mechanisms, activity patterns, and eating patterns. In this way his work seems to go beyond the confines of figurative art, and into the wider, more ambitious field of the creation of virtual organisms. This exhibition features a new organism and a description of it made by the artist. The exhibits form a realistic yet artificial space, similar to those in natural history museums. Choe's compelling works represent the aesthetics of some future era - where high technology machines are considered supreme - and in which, without doubt, mysterious, one-of-a-kind experiences can be provided. Gallery HYUNDAI, UANGEL Corp., WENTE / Takara Shuzo Co., Ltd.
* Open until 22:00 on 21 March and 2 May.